I saw Franz Ferdinand for the first time when they played the legendary Newport Music Hall in Columbus last May, just before the Scots headed into the studio to finish recording Always Ascending, and I was blown away by their live performance. In the 16 years of their existence, and the 14 years since their esteemed debut, however, the quintet has not once played a show in Indianapolis. That is, until this past Friday evening. Sandwiched by two massive festival appearances (Chicago’s Lollapallooza and Montreal’s Osheaga, respectively), this shindig proved to be well-worth its decade-and-a-half wait. Opening up for Franz was POW!, a San Francisco-based “cyber rock” group, who was also performing in Indy for the first time. The trio possessed a raucous intensity while on stage, relying solely on their music to do the talking for them. In fact, the only time the (surprisingly soft-spoken) frontman uttered any words outside of the music was before the set’s penultimate song and right at the end of it all. With a wildness reminiscent of Iggy Pop and a swagger that rivals Jack White, POW! had the right person leading them. At points his guitar sounded more like a bass, while the sometimes sung and sometimes emphatically yelled vocal delivery also kept things interesting. The trio, comprised of the frontman, the keyboardist, and a drummer, melded three decades’ worth of music all into one sound. Altogether, they hit on the synth-pop and new wave of the 80s, the garage rock and industrial of the 90s, and of course the British rock of the aughts, yielding a unique sound that I would label as intergalactic post-punk. Add to that incredibly smooth transitions from song to song, and it’s a wonder I hadn’t given their music a listen before. While POW! did a fantastic job of getting the night started strong, it’s no secret that everyone at the Vogue was there to see Franz Ferdinand. The band’s fifth LP, which released this past February, has been the cornerstone of their set lists ever since last year, so I expected to hear most of Always Ascending in person, and the Glasgow natives did not disappoint. After all, this was the Always Ascending tour. They kicked things off with the album’s second single “Feel The Love Go”—anyone who’s read my review of the record knows how special that song is to me, so it felt like the perfect set opener. Right away I noticed that the Scots’ set list was significantly different from the last time I saw them, and I figured that was due to it being a different tour this year. However, when I started going back through the band’s previous set lists from this tour the morning after, I realized the time period had nothing to do with it. This constant changing of song selection and order is worth noting for two reasons. For one, it keeps the fans coming back—this show was certainly not the same as the one I attended last Memorial Day Weekend, even though over half of the same songs were played. Perhaps more importantly though, it keeps things new and interesting for the band every night. I’m sure long-time Franz diehards have been aware of this from the beginning, but as someone who was really only a casual fan of the band up until about a year and a half ago, this stood out to me quite a bit. In addition to making their Indianapolis debut a unique one, the quintet gave their new audience a night to remember. Whether he was vocalizing it in between songs or engaging with the audience in the form of handshakes and varying one-on-one facial expressions, frontman Alex Kapranos was sure to emphasize throughout how much he loved and appreciated the Indy crowd. It was a kind of positive energy that transferred to the crowd quite effortlessly, allowing the endless cycle to continue for the entire hour and a half that the band was on stage. An hour and a half though? Kapranos and company are fairly well-known for their 3-song encores, but this time, to celebrate it being their first time in the Hoosier state, instead of just playing “This Fire” at the very end of the night, they closed with a drastically extended version of the song. Between Kapranos and the crowd, that chorus must have been sung dozens of times. It was a fitting send-off after such a wonderful time together. I like Franz Ferdinand more every time I see them, and I feel this concert at the Vogue cemented that. I was still secretly hoping they would have played a few cuts they omitted that evening, but with the kind of performance they brought to Indy’s Broad Ripple neighborhood, none of us who attended have any room to complain. 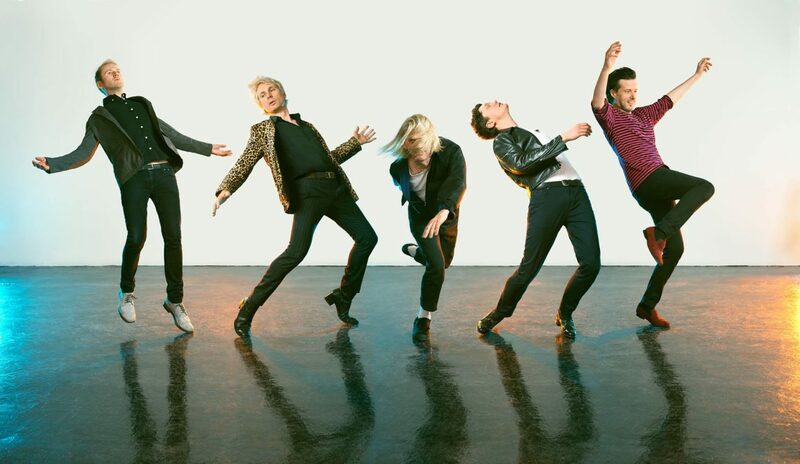 Franz Ferdinand still have several more shows on this U.S. run of the Always Ascending tour before they head back across the pond, so if you have yet to see them (on this tour run or ever before, it does not matter), now is your chance to do so. I promise you will not regret it, not even in the slightest.